Butterfly Reflections, Ink. : All Kinds of Awesome! Samantha here, and today I'm sharing a fun, merma-zing card!! :) Ha! I started by adding some watercolor-y look to white cardstock with Distress Inks! I used Peacock Feathers, Blueprint Sketch and Mermaid Lagoon (fitting!). I just smooshed the ink pad onto my kraft mat and then spritzed with water. Then, I pressed my cardstock into the watercolor and let dry. I repeated this process 2 or 3 times. And once it was all dry, I added some white splatters with white paint! Once the paint was all dry, I die cut the cardtock into waves with the new Lawn Fawn Stitched Wave Border dies! 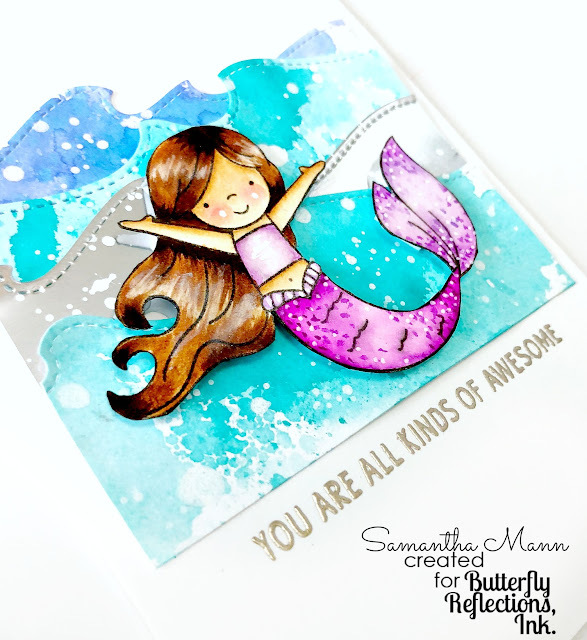 Next, I stamped and colored the ADORABLE mermaid from Neat and Tangled's Mermazing stamp set! I think she's soooo cute! Then, I fussy cut the image out and popped it up over the waves with foam tape! The sentiment from So Many Sentiments was heat embossed with Ranger's Liquid Platinum Embossing Powder to match the silver foil wave! Those vibrant colors !! 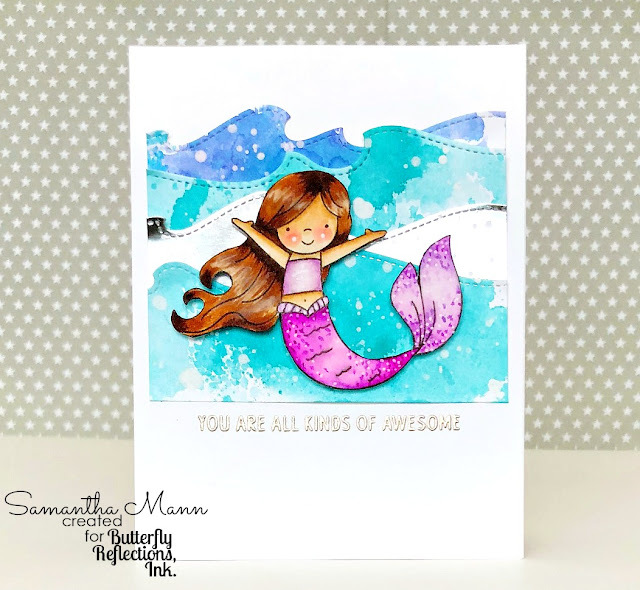 Your card is mermazing ! !